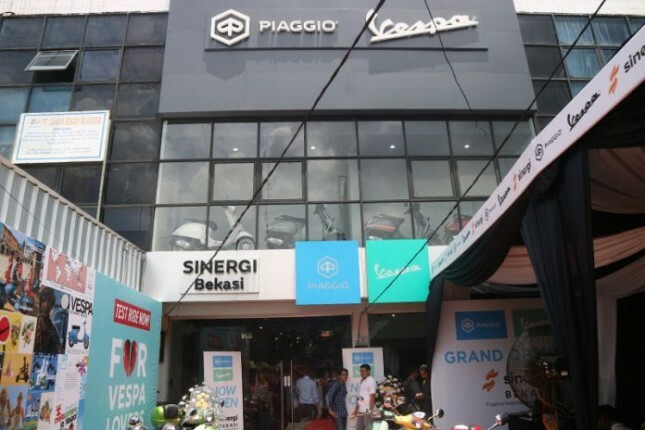 INDUSTRY.co.id - Bekasi, PT Piaggio Indonesia affirmed the Premiumization Roadmap strategy in Bekasi city with the opening of the second deal dealer with PT Anugerah Sinergi Pratama. With the concept of MotoPlex, this dealer becomes an extension of PT Piaggio Indonesia to expand the reach of customers and serve loyal customers in the city of Bekasi. This dealer is the fifth deal dealer between PT Piaggio Indonesia and PT Anugerah Sinergi Pratama which has been woven in the year 2015. Edo Januarko Chandra as Sales & Dealer Development Director of PT Piaggio Indondesia said the launch of this dealership is proof of our promise to always provide premium product line and after sales service under the auspices of MotoPlex concept that become industry standard. "This dealer is our fifth collaboration with PT Anugerah Sinergi Pratama and our second dealer in Bekasi city," said Edo during the inauguration of Piagio dealership in Bekasi, Monday (26/3/2018). Standing on 240 square meters of land, this dealer also brings the latest concept of Piaggio Group, MotoPlex. According to Edo, the opening of this dealer demonstrates the deep confidence between PT Piaggio Indonesia and its business partners in growing the market potential. "I thank PT Anugerah Sinergi Pratama for its support so far and congratulate on this achievement," he explained. Edo is very confident that this achievement will bring our brand far ahead and bring us closer to our customers. Meanwhile, Director of PT Anugerah Sinergi Pratama, Agung Siantar is very excited to welcome the opening of the second dealer in Bekasi City. "Our first dealership in Bekasi is a very satisfying success, thanks to the Piaggio Group's motorcycle products that meet the needs of customers in Indonesia who want a stylish motorcycle," said Agung.